As is always the case at the beginning of a new year, the band's official website has undergone various updates amounting this year to a major overhaul as things need to be brought bang up to date. Do check out all pages as there have been some radical changes. Meantime ...might as well start with some exciting news...a brand new Cold Flame studio album. The new studio album from Cold Flame is finally ready for worldwide release. Entitled 'Waiting for God. the new project from the band is very much a concept album featuring a merging of progressive rock and blues music exploring a general theme of past memories, present realities and future possibilities. There are fourteen new and original songs on the album which took over two years to complete. Eleven of the songs were written by band leader Pat including the epic twelve minute album title, whilst guitarist Rob has written three additional tunes for this album. 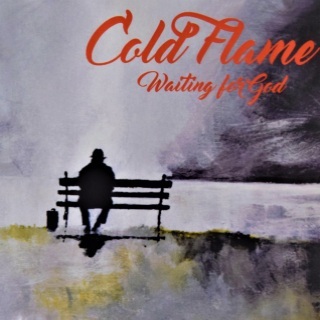 'Waiting for God' features most of the current Cold Flame line up as well as contributions from a couple of other musicians - most notably former band lead guitarist Simon Dowling. Lyrically and to an extent musically, there is rather a sombre downbeat overall feel particularly in those songs that reflect present local and worldwide realities but to balance the mood, there are additional songs featuring a more upbeat and optimistic feel.The front and inside cover artwork was painted by Welsh artist Sue Llewellyn whilst renowned Cumbrian photographer Mike Prince took the back cover shots. A more detailed account of the new album has now been posted in the Albums section of the band website.The album was mixed and mastered in August 2018 with printing/ duplication completed six weeks later. The album was recorded and engineered at Starring Studios in Littleborough, Lancashire with sound engineer Neil Scales who also contributed a bit of percussion and guitar. Check out Neil's home studio at http://www.starringstudio.co.uk. 'Waiting for God' is released as a download on Amazon, ITunes and Apple on Friday February 1st. The album will then be released worldwide as a CD on Friday March 1st. A 'soundbites' taster will be released into the public domain in January on various social media sites.The album will be available to purchase direct from the band from Friday 1st February by using the Shop links/ instructions found elsewhere on the band website. Meantime Tull's Ian Anderson continues to tread the boards on a continuation of the sensational 50th anniversary Jethro Tull world tour that began in March 2018 and is now set to continue till late Autumn 2019. In fact the second leg of this tour begins in mid January. Good news for sure though this will undoubtedly delay the proposed new Ian Anderson/Jethro Tull studio album. Further news on Ian Anderson and Jethro Tull can be accessed at http://www.jethrotull.com. Not to be outdone, guitarist Martin Barre will also be touring Tull music as well as his own across Europe and the USA. More at www.martinbarre.com where you will also find details on Martin's latest studio album - 'Roads less travelled'. One of the highlights of 2018 for the band was performing at the Blues on the Farm Festival in Kent. A brilliant line up featuring the cream of current British blues music, a wonderful setting and a top class organisational team and stage crew. However...a stark message of warning from all the acts including Cold Flame to the general public at large about the importance of keeping music alive. Live music is under real threat these days with a variety of issues including major changing social trends and an economic downturn contributing to the closure of many music venues and a considerable drop in the numbers of people willing to support the art medium we all love especially amongst the younger elements of society.The band are of course committed to keeping music live and particularly original music as well and look forward to seeing you all somewhere down the road this year. Check out the latest band gig guide for all confirmed Cold Flame shows to date for 2019. The Cold Flame Facebook presence altered last year causing some confusion in the process. Things have now settled down again.Here is a reminder of the two separate sites that currently focus on Cold Flame activities. There is now a brand new 'LIKE' page which you can access by following this link - https://www.facebook.com/ColdFlameBluesUK. A further page which Pat runs can be found at https://www.facebook.com/cold.flame.925. As is the custom when heralding in a new year, thoughts inevitably dwell for a time on the previous twelve months and certainly 2018 was not the easiest or happiest of years for several members of the band nor for many of the friends we know. In thanking everyone of you out there who has shown interest, support and enthusiasm for Cold Flame in recent years, we thank you all and hope that we continue to meet up at some point from time to time as and when time permits.